It’s mid-winter now, but the cold won’t last long and before you know it, spring will be poking its verdant head up from underneath the snow and you’ll be wanting to get back out into the garden. Your garden space will need extra attention if you’re planning to sell, and move in the spring or summer of next year, so here are some easy TLC ideas. This is essential after the last snows have melted and you’re left with patchy grass, dead flowers and lots of other detritus. Raking everything up and letting the place dry out and get some sun is one of the first things you need to do. 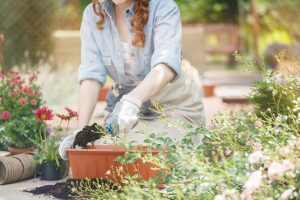 It’s also a good idea to plant some flowers that will bloom in early spring, as well as to re-seed your lawn once the temperatures are no longer falling below zero. Thinking ahead means you don’t have to scramble around nearer the time. Not all your plants and flowers have to go in the ground. Think about how you can incorporate them into existing structures in your garden. If you have a sturdy fence, then hang some pots from it, all arranged at jaunty angles. You could place lots of differently-sized pots and containers on an outdoor trolley, or create a living wall by growing lots of small, fast-growing plants on a series of closely-spaced trellis frames. If there’s one part of your home where you can let it all hang out when it comes to colours, it’s the garden. It’s not just about the green of the grass and the riot of the flowers. You can bring in even more shades and hues by painting your garden walls, your shed or by installing some big painted pots. As long as it all ties in at least vaguely with the overall look of your home, you can do as you like here. A spring viewing leads (hopefully) to a summer move, so if you already have the stage set for barbecues and garden parties then you’re halfway there! Take a look at your existing garden furniture and if it’s a little ratty, then replace it. If you don’t have any, then get some! Think about an outdoor sofa and maybe even a small kitchen space, rather than just the usual garden table set. There are lots of options for outdoor lighting that don’t involve static and glaring spotlights! Invest in lots of good-quality string lights – don’t skimp on the cost because you’ll find cheaper sets just fail. Solar-powered string lights are always better, as well as converted mason jars that light up when the sun goes down. Adding some lights to a dull or bare area is a cheap and easy way to jazz it up if you’re on a budget.